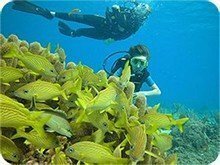 Discover scuba divingSimilan or local dive sites. The PADI Discover Scuba Diving program is the first step to enter the underwater world. This is not a course but a first experience or a way to dive for divers without licence. Your instructor will explain you the basic, prepare and check all your equipment, you will be ready for 2 dives entirely supervised by an instructor. No need for previous experience, the discover scuba diving program will make you fall in love with the underwater world. The feeling of swimming surrounded by fish, in the crystal clear water of the Similan islands is a lifetime experience. You get trained in a pool first so you can fully enjoy your dive at local reef or Similan feeling comfortable during your dives.